Luke opens his narrative of the Life of Jesus, not with Jesus himself, but with the story of the birth of his cousin John. Over the next 4 weeks, we will follow that story to its climax with the birth of Jesus. But today, we focus on Zechariah. But Zechariah isn’t the start of the story, either. As we heard in our readings today, the prophets had been prophesying that God will send a new leader. Micah, for example, writing 800 years earlier has talked about a new ruler to bring prosperity (feed his flock) and security. Jeremiah, writing at the time of the the Babylonian exile 600 years earlier, prophesied that God would build a new Jerusalem where all life would be peaceful and perfect. Zechariah knew all these prophecies, but surely never dreamt that he and his family would be part of God’s plan to redeem Israel. As priest, Zechariah knew all the messianic prophecies and looked forward to the day God would remove the yoke of foreign rulers from his chosen people. All we know about Zechariah is what we read in Luke’s first chapter and what we can extrapolate from that. We know that he was a priest, a hereditary function in Biblical Israel. At any given time there were about 20,000 priests in Israel. 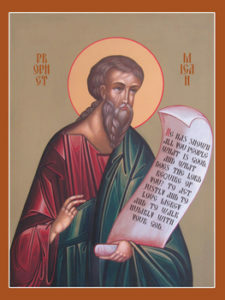 Every direct male descendent of Aaron, Moses’ brother, was a priest, and only them. In Genesis (49:7) God appointed the descendants of Levi, one of the 12 sons of Jacob / Israel, as the priestly tribe. Unlike the other tribes, they received no land inheritance. When the Israelites were wandering in the wilderness, God told Moses that Aaron and his descendants would be the priests. Other descendants of Levi, the Levites, would also serve but in a lesser capacity. Hence we have “the Priests and the Levites” that we read about in the Gospels. Apart from Zechariah being a priest, we know that he and his wife Elizabeth had no children. She was past child bearing age. This was a real tragedy for them. Back then, childlessness was grounds for divorce. Of course people blamed the woman for being barren. It was shameful for the woman who had no children – remember that this was an honour / shame society. What did Priests do in the Temple? In the film clip we saw. Zechariah’s “family” of priests was serving in the temple. Details about the priesthood are mainly found in the Torah: who could serve, what they did and how to do it. King David had organized the descendants of Aaron into 24 families – Zechariah belonged to the Family of Abijar. All priests served for Passover and Yom Kippur, and the 24 families took turns of a week at a time to serve in the Temple in Jerusalem, so each family had 2 weeks a year. Each family had nearly 1,000 priests and there were many jobs fort them to do in the temple. The jobs were assigned by drawing lots. The priests slaughtered and roasted the sacrificial animals, spattered the blood on the corners of the altar, dispensed the meat, and so on. They cleared out the ashes, looked after the candles, cared for sacred vessels and robes. 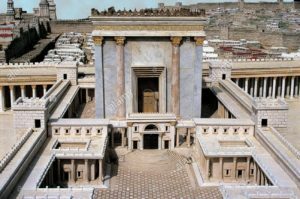 During the week when Zechariah’s family line were serving at “the temple of the Lord”, Zechariah was chosen by lot to perform the evening incense offering. This was the most solemn and holy of the tasks, and each priest would only perform it once in his lifetime. After that, his name was removed from the lottery for that task. But many never got the chance. Every priest dreamed about this –the highlight of the priest’s career. When Zechariah’s name came up. he would enter the Holy place in white robes and no sandals. Two other priests would enter with him. They would leave when they had made everything ready. The Holy Place, within the Priest’s Court, was the second most holy part of the temple. (The most sacred part was the Holy of Holies. Once a year, on the Day of Atonement the High priest entered alone to pray for forgiveness for the nation’s sins). 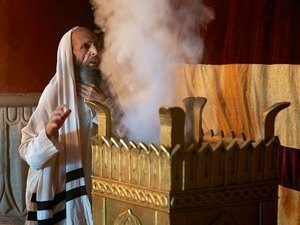 In the Holy Place, the Golden Altar of Incense stood before the veil separating the Altar from the Holy of Holies. (This veil, we are told, was ripped apart when Jesus died.) While Zechariah was in there, the laymen waited in the Court of Israel and the other priests in the Court of the Priests. They prayed in deep silence while yet another priest sacrificed the evening lamb at the great Altar of Burnt Offering. When he’d finished the sacrifice, he gave a signal to Zechariah, that he had completed this part of the ceremony . 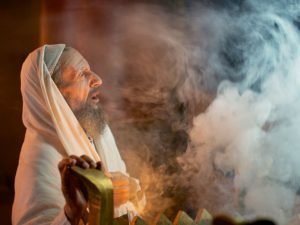 Then Zachariah would throw the incense on the fire of the Golden Altar, and watch its fragrant smoke rise with the prayers he offered for the people. It was while Zechariah was alone at the Altar that God spoke to him through the Angel Gabriel. “Your prayers are answered,” he said. Which prayers? Well, those for a son – but that was also the start of the salvation story for Israel and the world. As I thought about this story, I thought about how God speaks to us today. He spoke to Zechariah, and later to Mary in the familiar story of the annunciation, through the Angel Gabriel. Angels appear more than 20 times in the NT as messengers from God, this being the first chronologically. The word in Hebrew and Greek for angel means “messenger”. As I was researching videos for our Advent and Christmas services, I found angels portrayed in many different forms. Unlike earlier art, the most common ones were the wind or a light, maybe a swirling light. Like Zechariah, we are more likely to recognize a messenger from God if we live prayerful lives. God’s messengers may be our friends, or people we meet; our dreams or what we read and see in various media. For me, the messages often come in books. I can’t tell you how many times I’ve felt an urge to buy a book which sits on my shelf. Then, one day, I’m pondering some issue and I remember that book and find in it the answer, or the path that leads me to resolution. There are also messages through social media. So many messages bombard us daily.like Zechariah, we need to ask “How do I know that this is so?” Again, we can take a lesson from this story. Keep silence to ponder, wait for God to fulfil his word. But also remember we don’t just sit back and wait for God to fix everything. We work towards making our prayers happen. 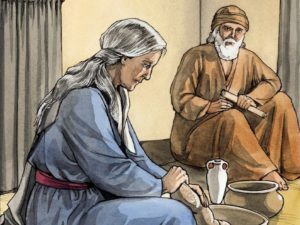 Zechariah shared his news with Elizabeth, but otherwise they seem to have been reticent to broadcast what had happened. I am sure Zechariah did his part to make their prayers come true, and in due time, John was born. We’ll hear the continuation of this story over the next few weeks.